I noticed high bandwidth caused by bot that identifying self as empty user agent string	7,474 hits	514.35 MB	since begining of month. If I block it in .htaccess, AutoTweetNG generates non-SEF URL (...index.php?option=com_content&view=article&id=...). What is relation between this bot and AutoTweetNG and why so high bandwidth produced? Site has 5000 articles and every day we add 3-5 new articles. Does Polling Interval is related with issue above? If it does, what is optimal interval for polling? 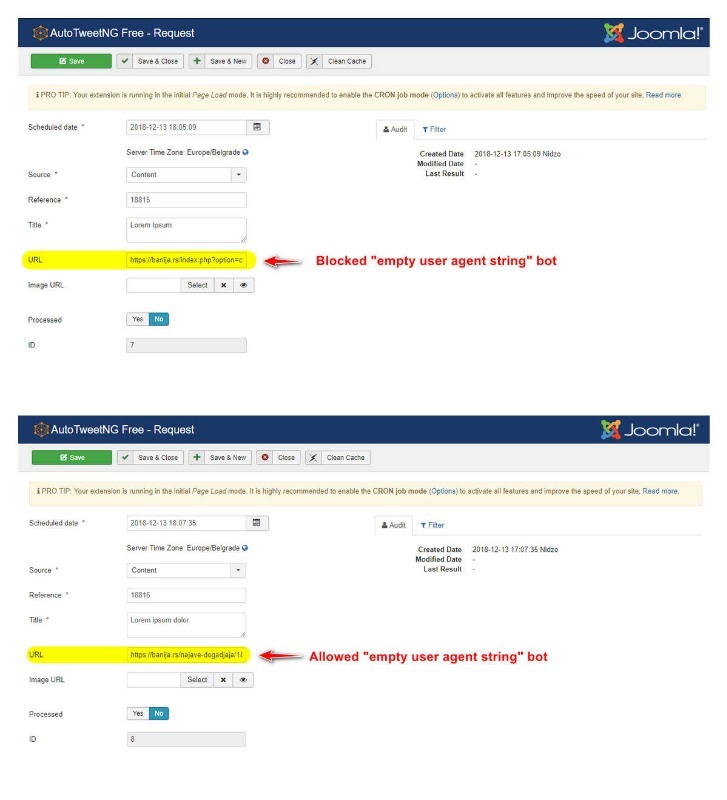 Joomla has the front-end site and the back-end site. The back-end site does not have a way to know the final URL of the content items. To overcome this limitation, AutoTweet sends queries to the front-end site to generate the permanent links of the posts. There are cases where even in the front-end site, it is better to send an independent query to generate the permanent links. Since these are internal queries, they don't generate real connections on a regular site. You can adjust this setting in Options/Advanced/Routing mode. By default, Compatibility. Please, test the setting on Performance mode. Hope this helps! Let us know if there is anything else we can do. It is obvious that there is relation between AutoTweetNG and blocking empty user agent string bot. Is there any chance to have this bot blocked and have SEF URL-s generated with AutoTweetNG. Last edit: 4 months 1 week ago by Nidzo. We have defined a user agent for the routing queries. This enhancement will solve your issue. It will be available in the next release. If you are a Customer, please, Open New Issue to get access to the support service and send you a build for you.